One of the relatives of Elimelech, husband of Naomi; a wealthy Judean, living at Bethlehem in Judah (Ruth ii. 1). He was one of the kinsmen of Ruth; as such he had the privilege of redeeming the family estate sold by Naomi after Elimelech's death. Therefore when Ruth appealed to his kinship, he redeemed the property (Ruth iii. 9, iv. 3). In consequence of this he had to marry Ruth, in order "to raise up the name of the dead" (Ruth iv. 5, 10). Their son Obed was, according to tradition, the grandfather of David (Ruth iv. 22). Boaz is identified by some rabbis with the judge Ibzan of Bethlehem (Judges xii. 8). It is further said that he lost all his sixty children during his lifetime because he did not invite Manoah, Samson's father, to any of the marriage festivities in his house. For, since Manoah was at that time without children, Boaz thought that he need not consider on such occasions a childless man who could not pay him back in kind (B. B. 91a). According to Josephus, "Ant." v. 9, § 1, Boaz lived at the time of Eli. Boaz was a just, pious, and learned judge, and the custom of using the Divine Name in greeting one's fellow-man (Ruth ii. 4) formulated by him and his bet din received the approval of even the heavenly bet din (Mak. 23b; Yer. Ber. ix. 14c; Ruth R. to ii. 4). Being a pious man, Boaz on his first meeting with Ruth perceived her conscientiousness in picking up the grain, as she strictly observed the rules prescribed by the Law (compare Gleaning of the Fields). This, as well as her grace and her chaste conduct during work, induced Boaz to inquire about the stranger, although he was not in the habit of inquiring after women (Ruth R. to ii. 5; Shab. 113b). In the conversation that followed between Boaz and Ruth, the pious proselyte said that, being a Moabite, she was excluded from association with the community of God (Deut. xxiii. 4). Boaz, however, replied that the prohibition in Scripture applied only to the men of Moab, and not to the women. He furthermore told her that he had heard from the Prophets that she was destined to become the ancestress of kings and prophets; and he blessed her with the words: "May God, who rewards the pious, also reward you" (Targ. Ruth ii. 10, 11; Pesiḳ, ed. Buber, xvi. 124a). Boaz was especially friendly toward the poor stranger during the meal, when he indicated to her by various symbolic courtesies that she would become the ancestress of the Davidic royal house, including the Messiah (Ruth R. to ii. 14; Shab. 113b). As toward Ruth, Boaz had also been kind toward his kinsmen, Naomi's sons, on hearing of their death, taking care that they had an honorable burial (Ruth R. to ii. 20). Although Boaz was the prince of the people, he himself supervised the threshing of the grain in his barn, in order to circumvent any immorality or theft, both of which were rife in his days (Tan., Behar, ed. Buber, viii. ; Ruth R. to iii. 7). Glad in his heart that the famine was over in Israel, he sought rest after having thanked God and studied for a while in the Torah (Tan., l.c. ; Targ. Ruth iii. 7; and Ruth R. ib.). Aroused out of his first sleep by Ruth, he was greatly frightened, as he thought that she was a devil; and he was convinced of the contrary only after touching the hair of her head, since devils are bald (Tan., l.c.). When he perceived the pure and holy intentions of Ruth he not only did not reprove her for her unusual behavior, but he blessed her, and gave her six measures of barley, indicating thereby that six pious men should spring from her, who would be gifted by God with six excellences (compare Isa. xi. 2; Sanh. 93b; Num. R. xiii. 11; Ruth R. and Targ. to Ruth iii. 15; the names of the six men differ in these passages, but David and the Messiah are always among them). 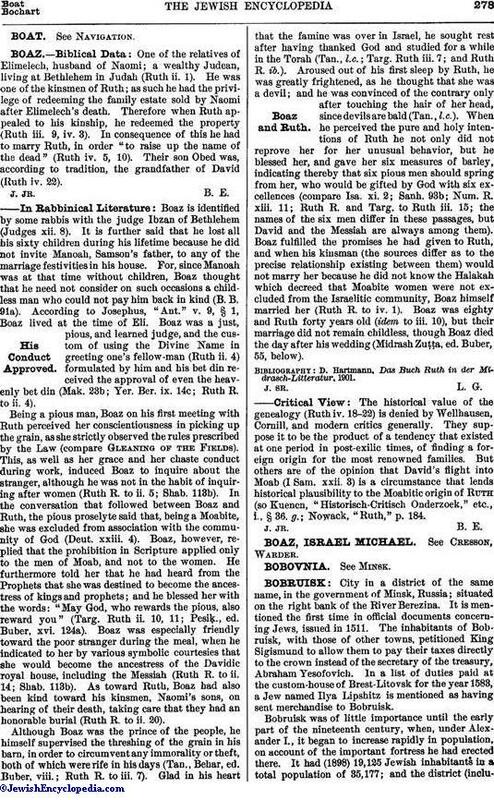 Boaz fulfilled the promises he had given to Ruth, and when his kinsman (the sources differ as to the precise relationship existing between them) would not marry her because he did not know the Halakah which decreed that Moabite women were not excluded from the Israelitic community, Boaz himself married her (Ruth R. to iv. 1). Boaz was eighty and Ruth forty years old (idem to iii. 10), but their marriage did not remain childless, though Boaz died the day after his wedding (Midrash Zuṭṭa, ed. Buber, 55, below). D. Hartmann, Das Buch Ruth in der Midrasch-Litteratur, 1901. The historical value of the genealogy (Ruth iv. 18-22) is denied by Wellhausen, Cornill, and modern critics generally. They suppose it to be the product of a tendency that existed at one period in post-exilic times, of finding a foreign origin for the most renowned families. But others are of the opinion that David's flight into Moab (I Sam. xxii. 3) is a circumstance that lends historical plausibility to the Moabitic origin of Ruth (so Kuenen, "Historisch-Critisch Onderzoek," etc., i., § 36. g.; Nowack, "Ruth," p. 184.